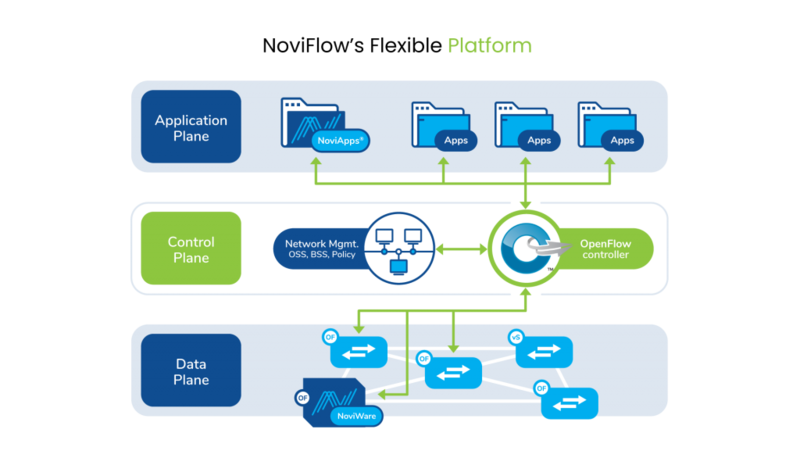 The NoviWare™ Network Operating System is the networking industry’s highest performance implementation of SDN, featuring Open, programmable match-action pipelines optimized for high performance switching chipsets such as the Mellanox NP-4 and NP-5 and Barefoot’s 6.5 Tbps Tofino chip. Architected from the ground up to be a reliable, scalable platform for OpenFlow, gRPC, and P4-Runtime, NoviWare offers the industry’s most complete implementation of the OpenFlow 1.3/1.4/1.5 standard as well as a smooth upgrade path to the next generation of PISA architecture based SDN applications and solutions. NoviWare is ideal for use in switches, WAN IP/MPLS routers, network appliances and other high-bandwidth forwarding planes. NoviWare has been deployed around the world in NoviFlow’s NoviSwitch™ products. It is also offered via software license to OEM and ODM switching platform suppliers. And NoviWare is available for use in production networks in equipment running the Mellanox NP-5 and the Barefoot Tofino, and is also supported on the X86 platforms for use in network application development and testing. By supporting Open Standards, NoviWare frees customers from vendor lock-in, and enables to choose best-of-breed solutions for their networks instead of restricting them to vertically integrated silos. One of NoviWare’s greatest competitive advantages is that it follows a software development cycle, resulting in up to three major software upgrades per year. And thus offers long in-service lifetimes for devices using NoviWare. It also means that the capabilities of NoviWare can be quickly and easily extended to meet evolving customer needs. Match fields in the SDN industry, and even makes it possible for users to define new match fields, even in the packet payload. Far more flexible classification (more varied sources of classification) as NoviWare implements the most complete set of OpenFlow. The ability to track to 1 million meters using these flexible flow classifications and associated policies (Drop, DSCP Remark) compliant with RFC2697 srTCM and RFC2698/ MEF 5 trTCM. 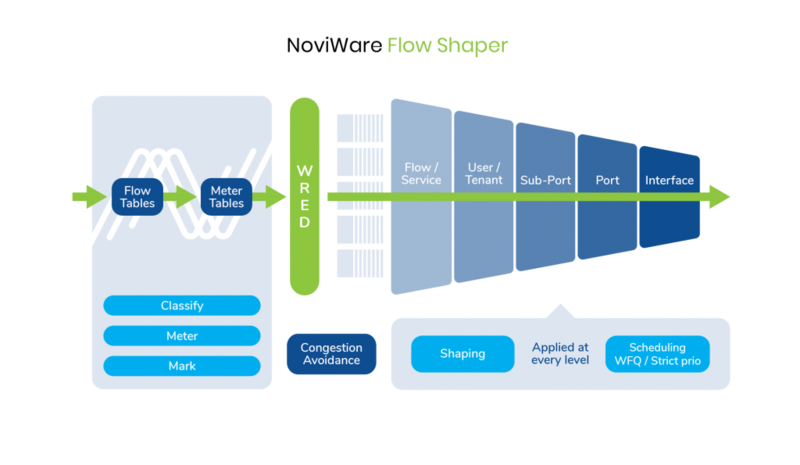 Flows can be placed into any of 16 queues per class and a maximum of 46,000 classes for a total of 736,000 queues, and can then be forwarded through a 4-level hierarchy where traffic shaping is applied based on priority and rate limits, with 1 GB of deep DRAM buffer memory used for traffic shaping and Weighted Random Early Detection (WRED) providing for congestion avoidance.